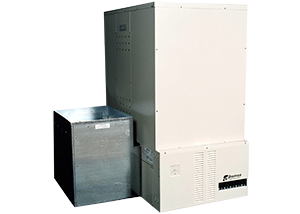 The Steffes Comfort Plus Forced Air Furnaces (4100 Series) are ducted heating systems designed to stand alone or work in conjunction with a heat pump for increased efficiency. Our Electric Thermal Storage (ETS) technology allows the Comfort Plus Forced Air Furnace to convert electricity to heat during off-peak hours, when the demand for and price of electricity is low. Specially-designed ceramic bricks within our units store vast amounts of heat for extended periods of time. With this stored off-peak heat, the Steffes Comfort Plus Forced Air Furnace can deliver clean, consistent comfort 24 hours a day. In addition, by only consuming electricity during off-peak hours, the Comfort Plus can save you up to 70 percent on your electric bill compared to traditional heating systems. All Steffes Comfort Plus Forced Air Furnaces are equipped with a variable speed blower to ensure consistent, even temperature output to meet your comfort requirements. For even greater efficiency all Steffes Comfort Plus Forced Air Furnaces can be interfaced to a heat pump system. Unit is factory-configured with multiple-line voltage, single-phase circuit connections. If single feed to the element and blowers/controls circuits is desired, an optional single-feed kit is available. Phase-balancing is recommended when making connections in 3-phase applications. The size and heating ability of the system required for an application is dependent on the heat loss of the area and the power company’s off-peak hours. Refer to the Maximum Maintainable Heat Loss for heating abilities in specific charge strategies. Contact a building contractor or architect if you have structural weight concerns of the installation surface selected. Adhere to all national and local electrical and building code placement requirements for electric heating appliances. There are required installation clearances to account for. Contact the factory for this information. The factory-built return air plenum is configured for housing an indoor coil. Dimensions listed are that of the inner coil area in this plenum. For larger coils, field provisions to the plenum are necessary or it will need to be supplied by the installer. Heat pump systems are one of the most efficient methods of heating and cooling. Utilizing a Comfort Plus unit with a heat pump allows the heat pump’s high efficiency to be combined with off-peak electric rates making this heating and cooling system the lowest operation cost option. In addition, the Comfort Plus unit ensures comfort regardless of outdoor temperature. 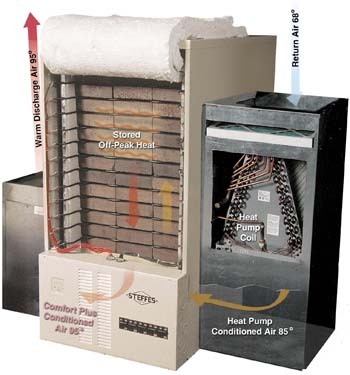 In heat pump applications, the Comfort Plus unit replaces the resistance strip heat or secondary heat, which is typically required as a supplement or backup to heat pump systems, with low cost, off-peak stored heat. As outside temperatures decline the stored heat in the Comfort Plus unit is used in conjunction with the heat pump’s heating capacity to satisfy comfort requirements. During on-peak hours or when the demand for heat is at the point where the heat pump alone cannot satisfy the heating requirements, the stored heat is used to supplement the heat pump. The Comfort Plus unit allows the heat pumps efficiency to be utilized even during cooler outdoor temperatures. The Comfort Plus/Heat Pump combination, when used with off-peak electric rates, is the most economical heating and cooling system available. The room thermostat in the home is set to desired comfort level. If room temperature decreases below the room thermostat set point, the system is energized to deliver heat. Upon a heat call from the room thermostat, the heat pump’s outdoor compressor unit is energized and warms the A-coil in the return air duct of the Comfort Plus unit. At the same time, the Comfort Plus unit’s supply air blower is energized. The supply air blower draws air from the home (shown at 68° F) across the air filter and the heat pumps A-coil extracting heat from the coil as it passes through it. A sensor monitors air temperature after the A-coil. If the air temperature is warm enough to provide comfort to the homeowner (generally 90° F or higher), the supply air blower simply delivers the warm heat into the home through the supply air duct. Air temperature after coil in the diagram is shown at 85° F.
If air temperature after the heat pump coil is below a comfortable level (generally less than 90° F), the Comfort Plus unit’s core blower will modulate low cost, “Off-Peak” stored heat into the duct stream so comfortable heat (generally 90° F or higher) can be delivered into the home. Since heat pumps generally have an operating efficiency of 150%-300% or greater (depending on outdoor temperature), the Comfort Plus system first utilizes the heating ability the heat pump offers. If the heat pump doesn’t have the ability to satisfy comfort and space heating requirements, the Comfort Plus system starts to work with the heat pump utilizing low cost, off-peak energy to ensure comfort for the user at all times. Combining the heat pump’s efficiency with the “Off-Peak” Comfort Plus system yields very low operating costs for the end user along with great comfort.